Below is a breakdown of the membership categories for the 2019 season. 9 Hole Membership – Ladies & Gentlemen – £325 – includes use of the facilities of the Clubhouse & Bar, free Room Hire, Insurance & Loyalty Bar Card. Junior (under-16) – £50 or £10.00 if a Parent or Grandparent is a paid -up playing member. 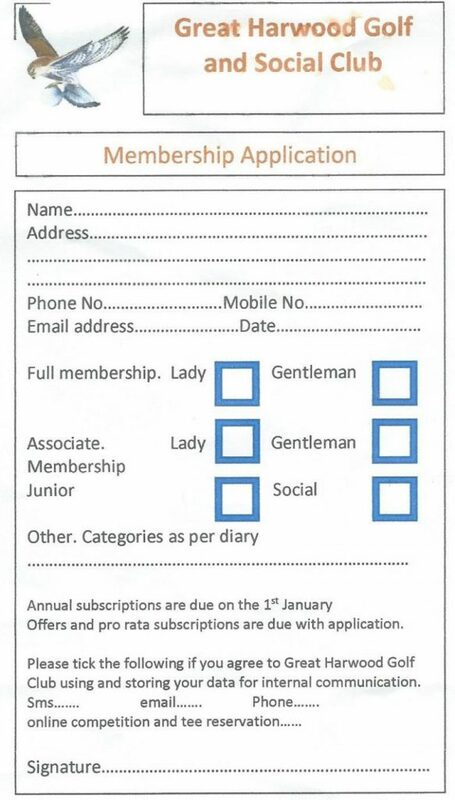 2nd Club Membership – Ladies & Gentlemen – £100 – must have held membership with their existing club for minimum of 2 years. The facilities of the clubhouse and the bar are available to all members over 18. Club Golf insurance covers all playing members whose subscriptions are paid up. New to golf membership is available only to members who do not have or never had a handicap or been a member of any golf club. 2nd club membership is not open to recent past members of Great Harwood Golf Club unless they have moved out of the locality. 2nd club members must have been members of their main club for 2 years and hold a handicap certificate with them. 2nd club members are not eligible to play in any club competition, nor play on the course on Saturdays before 2.00pm and all day Sunday. 9 hole members may only play one 9 hole game per day, they may not use the course on Sundays and Saturdays before 2.00pm. Associate members may only use the course Monday to Friday. 4 day members may only use the course on Monday, Thursday, Friday and Saturday.